It's mid july and we are smack in the middle of summer time here in Islamorada, Florida Keys. The fishing has been stellar. July has been very consistent with the tarpon action, most trips we are getting multiple fish and I've only had one trip in the last 16 I've had in July that we have not caught at least one tarpon. The early morning fishing is the ticket in the everglades, mullet have been easily obtained in a couple spots where if you get there early, one throw of the net and you have plenty of bait for 2 days of fishing. Most of these fish are resident fish - no longer the 100+ lbers though more fish in the 30-60 lb range with the occasional brute here and there. Aside from the tarpon I've been doing a good bit of snook fishing which has been great too. Pilchards (white bait) have been in the near-gulf where we can chum them up and throw a net on them. While they don't show up every day, most days they do and while your waiting you can usually catch nice size snapper and trout drifting cut bait. 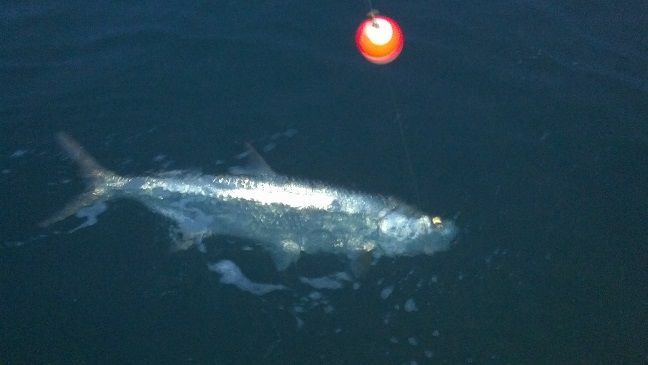 The incoming tides have produced good fishing along the shallow shorelines of the mainland. With the light winds the water is very clean and not too muddy which these fish like. The occasional redfish is mixed in there too giving the opportunity for the backcountry SLAM of tarpon, snook, and redfish. Well that's what I've been up to the last month or so, there is also good fishing in the gulf this time of year for permit and cobia, though I've been sticking to the routine mentioned above because it's just been so good! Fishing through October and early November has been pretty fantastic in the Florida Keys. Business is slowly starting to pick up agian as we get into the winter time. This is the time of year offshore for sailfish, and in the backcountry redfish, snook, mackerel, and more. 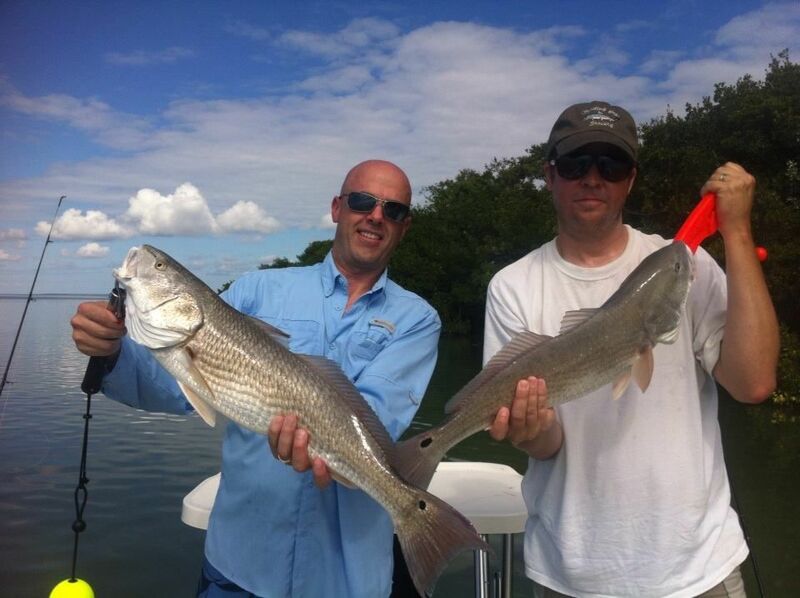 The redfish and snook fishing deep in the everglades has been good. I've been getting lots of snook fishing live pilchards which we catch off the shorelines and nearby islands this time of year. These snook are in the 5-10 lb range mostly, with the occasional larger one. Last week I had double digit snook in number most every day. Redfish have not been quite as plentiful though as it cools off they will more and more become the predominant species in the everglades. Snook are a blast on light tackle if you've never caught one, and honestly one of my favorite fish to target personally. We've also been having a lot of bait pushing down for the fall bait run, mostly black mullet and big schools of pilchards. With the northerly breezes this time of year before it gets real cold the fishing can be excellent if you catch it right. We've had incredible tarpon fishing in the everglades the past couple weeks from this. Early in the mornings I've witnessed over a dozen tarpon from 20 to 150 lbs in the air at once busting bait, it is truly a sight to see. 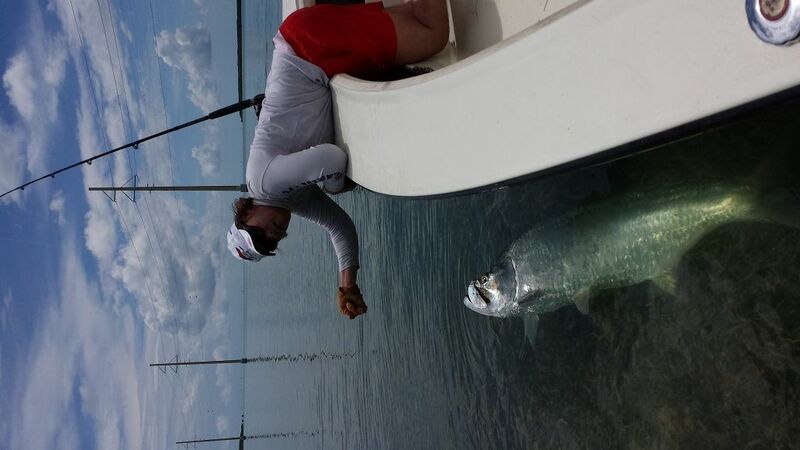 We've been catching tarpon still, mostly in the 30-80 lb range. We caught a couple nice tarpon the other day, and had shots at fish on every trip I've been on. The smaller fish are often much tougher to hook but still a blast to crank on even if just to get a few jumps and be gone! 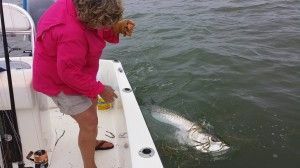 Of course once the weather really cools the water down to 70 degrees or below, the tarpon are pretty much done with in our area until it really warms up again usually in the later winter/early spring. The spanish mackerel fishing in the gulf along with pompano, ladyfish, trout, and cobia can be good through the winter. That is another good option especially on calmer days. Summer time is officially here in the Florida Keys. Summer time tarpon are here too. 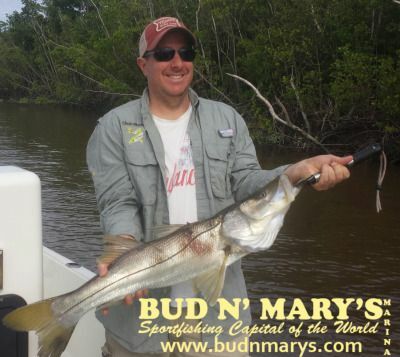 Those are more of the resident fish that can be found in the backcountry and around Islamorada that are often smaller in size but just as fun to catch. We've been finding lots of mullet in the backcountry and getting those early in the morning then fishing the channels and bays. We went 8 for 14 the last two days, most fish are in the 30 to 60 lb range though we did finish the day today with a 100 lber locally around Islamorada. In the backcountry they've been biting on the in and out tides, morning or afternoon - sometimes both! In the bays trout and snapper are in good supply though the mangroves should be moving offshore soon to spawn. 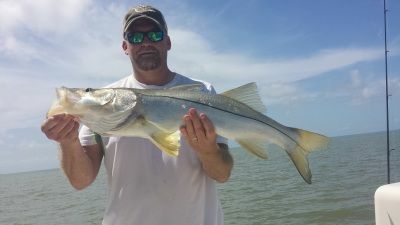 Snook can be found throughout the cape and flamingo areas, and most the redfish this time of year are up in the super skinny water, so make sure you bring your shallow draft boat for them! With the winds that have been blowing I haven't been out in the gulf much though that is often a good bet this time of year for permit. 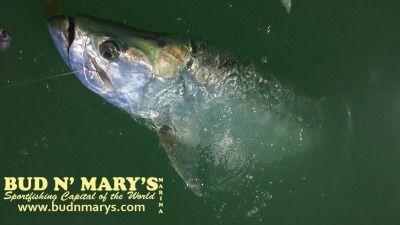 Spring is here in Islamorada and so is the start of florida keys tarpon fishing. We've had luck lately fishing in the evenings as well as during the day. The evening falling tide is a good bet with live crabs, we got this nice 80 lber plus a couple other missed bites one night last week. Today we got another nice 75-85 lb fish during the day fishing a live mullet in the backcountry. We also caught loads of trout, ladyfish, and jacks, plus a blacktip shark all in the same area. Later in the day we ran out in the gulf and saw one nice cobia unfortunately he spit the bait and never was to be seen again. We ran further out and found the tripletails swarming, caught about 15 or so including our limit of keepers. 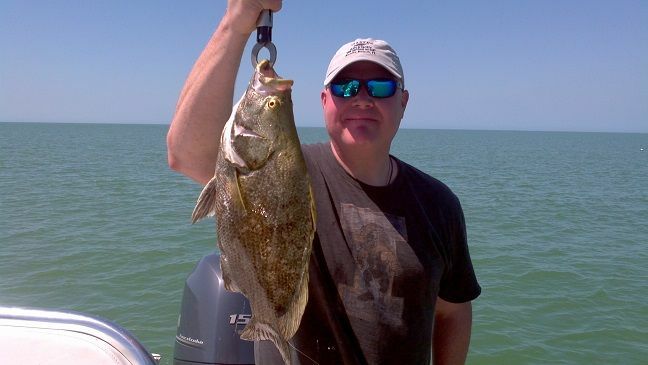 Tripletail fishing is lots of fun, run and gun running the crab trap lines and sight fishing for 'door mats' a.k.a. big triple tail laid up on the surface! If your thinking of coming to Islamorada, the next few months are prime time for all kinds of fishing in the islamorada backcountry!